WEEK OF ACTIONS AGAINST ICE RAIDS & FOR FAIR AND JUST IMMIGRATION! Illustrating the need to fix our broken immigration system that keeps families apart, the recent increase in ICE enforcement and questionable tactics has left families separated and communities fearful of law enforcement, making them more vulnerable to exploitation and abuse. Immigrants and their allies will join together to call for immigration reform and denounce the raids. After Monday's opening activities, Tuesday will feature regional Labor Councils, Labor leaders, and day laborer centers of Northern California coming together to say, "immigrant rights are worker rights!" Teachers, youth and children will be mobilizing to speak out on Wednesday. On Thursday we will be protesting the criminalization of immigrants and Friday we will close with a rally and march to Congresswoman Pelosi's office to demand fair and humane immigration reform. Friday, March 2, 2007: 11 am – 1 pm. March from 16 x Mission BART to San Francisco Federal building (Golden Gate x Larkin, San Francisco, CA), Rally & Program at Federal Building. Why: More than ever we need a fair and just immigration law that keeps families and loved ones together. Recent ICE community and workplace raids have terrorized the immigrant community and ripped families apart; immigrant communities are increasingly marginalized and frightened. Community organizations, churches, unions and social service agencies are boldly coming together to call for an end to all ICE raids and for regional and local authorities to publicly oppose detentions and deportations and ensure the safety of all our communities. Where/When: Monday – Thursday, Feb 26 – March 1, 2007. 630 Sansome St., San Francisco, CA, 11 am - 1 pm daily. Tuesday, Feb 27 - Theme: "We Are Workers!" Wednesday, Feb 28 - Theme: "We Are Families!" Detailed Event Description Rally (all) & march (CPA). Chinese women immigrant workers, laid off, boycott of Monster Cable. Thursday, March 1 - Theme: "Equality for All!" Event: Queer & immigrant sector also highlighted. 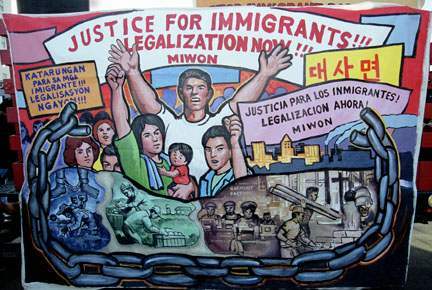 Why: "Stop the Raids, Fair & Just Immigration NOW!" Description: March from 16 Mission BART to SF Federal Building. Program including speakers and Hei Gu Chinese Drummers. Visuals: People of different nationalities, including parents, families, children, young people, standing up against ICE raids. Signs & colorful banners. Hei Gu Chinese Drummers. Detailed Event Description: Members of Mujeres Unidas y Activas will be doing street outreach and community theater. Miembras de Mujeres Unidas y Activas estaran haciendo alcance y teatro comunitario. OAKLAND - Woodfin Suites Boycott – Stand up for Immigrant Workers! Event Description: An ongoing picket in front of Woodfin Suites who failed to pay the living wage as approved by Emeryville City Council, and for intimidating and harassing workers who are trying to share the information with other workers in the hotel. Part of ongoing actions every Tuesday and Saturday. Detailed Event Description: We are having a DREAM rally to create awareness about the DREAM Act and how it will impact thousands of undocumented students! Show your support because EDUCATION IS A RIGHT! Type of Event: Vigil, Walk and Cultural Program and press conference for community safety and justice. Detailed Event Description: Gathering and vigil starts at 4:30 pm on the corner of 37th Avenue and San Leandro Boulevard (about one block east of the Fruiitvale BART Station), rememberance of Juan Chales (day laborer murdered on Sunday Feb 18 in Oakland) and other day laborers who have been killed and those who are violently attacked and harassed every day. Then group marches with candles to the Fruiitvale BART Station plaza area & marches and the women's organization Mujeres Unidas y Activas' Theater Group performs. About 5:30 pm vigil and march continues to Workers' Center at 2501 International Blvd, where we will continue the program and briefing with more speakers, poetry, song as lively community gathering, sharing refreshments, sweet bread and coffee to close out the evening of voices for justice and peace in immigration services and reform.more cultural program and coffee and sweet bread. Lucha Unida del Jornalero, a community organization of Oakland day laborers, is convening a vigil and cultural celebration to denounce the recent immigration police raids and demand just and fair immigration reforms. Our event will include speakers, poets, community and street corner day labor leaders, colorful art banners, candles and the names of those who have suffered loss of family members, co-workers and neighbors to immigration laws and raids. Detailed Event Description: Members of POWER will be rolling around on a flatbed truck and sound system to raise awareness about people's rights in light of the ICE raids and ICE intimidation on corners in the Tenderloin, and also to raise awareness about the march the following day. Parents, Communities Urge - BOYCOTT MONSTER CABLE!! Parents and workers from Monster Cable and their allies in the Chinese Progressive Association and other groups have stepped up their campaign for economic justice for laid off workers. 2/28 Weekly Boycott Action 11 am - 1 pm, Wed. Feb 28: San Francisco Immigration Building, Sansome St. and Wahington St., downtown San Francisco. Joint Action/Boycott Picket: Monster Cable Workers Join in the Week of Action Against the ICE Raids. Come spend your lunchtime with laid-off workers, community allies and musicians! For more info contact Shaw San at shawsan@cpasf.org. Call Monster Cable CEO Noel Lee at: 415-508-0000 (cell) and headmonster@monstercable.com. Tell him you will not purchase Monster Cable products until the company fairly resolves the workers demands. Ask Mr. Lee if he can't afford a sports car or two, to do justice for the workers who made him wealthy over the past 20 years. (see Quick Facts, below). ENDORSE THE MONSTER CABLE BOYCOTT! Please contact Shaw San Liu at shawsan@cpasf.org or 415-391-6986 ext 313, to join the growing list of official boycott endorsers (see list below)! Call Apple CEO Steve Jobs at 408-996-1010, Fax at 408-974-2483. Tell them that cables and igadgets shouldn’t come at the cost of hurting workers! See the great article by Tyche Hendrix from yesterday's SF Chronicle. the photo shows Ana Pérez, director of the Central American Resource Center - Chronicle photo by Lea Suzuki. Since the Immigration raids at the Woodfin Hotel in Emeryville in October, the cold-hearted Swift Raids which rounded up 1300 people right before Christmas, and the earlier ICE visits to some of our SF Schools, parents, workers and immigrant rights activists have been speaking out to stop the raids and repression and for a fair and humane immigration policy. More than ever we need a fair and just immigration law that will allow immigrants the ability to reunite and remain with their families. Recent ICE community and workplace raids have been terrorizing the immigrant community and ripping families apart. Good story on a Sacramento teacher, and a graduate of our Bilngual /Multicultural Education Dept. at CSU-S. The town of Greenfield is ripe with farms, fields of tomatoes, chiles and lettuce – picked by a large migrant farm community. Tucked away in the Salinas Valley of Monterey County the town has limited education resources. The high school drop-out rate is high. For many of the youth, there are limited avenues to get out of Greenfield. For Martin Ramirez though, one word opened his world wide open. Throughout high school Ramirez ran with gangs. "All of my friends are either dead, locked up or in jail," said Ramirez. But now his life is much different. Today he is a teacher at Luther Burbank High School in Sacramento, a profession he never even considered. "Never entered my mind because I was driving teachers crazy when I was in school," said Ramirez. But one of his teachers noticed the young man didn’t only have street smarts. Mr. Dean Willingham had a heart-to-heart with Ramirez when he was 18. He simply told him he had "potential." "Nobody had told me that. Truth is I didn’t even know what potential meant. I was 18 years old and I said 'potential?' I go, 'What does potential mean?'" He quickly learned the definition and with Willingham’s help he decided to put that potential to the test. He applied and was accepted to American River College. In the fall of 2000, Ramirez piled his belongings into his car and headed up 101-North from Greenfield to Sacramento. Ramirez would be the first in his family to go to college. And despite the opportunities that lie ahead, he admits his dreams were still small. "All I wanted was a little certificate to work in a front office. I remember the counselor Mr. Ruedas asked 'Why? why do you want to do that?'" Manuel Ruedas works at ARC with students on developing their education and career goals. He says it’s not uncommon for first-generation students to fail to fully understand what they can do with a college education, mostly because they’re the first in their families to pursue an education. "They need role models. They need to see their peers achieving academically so they can follow the same path," Ruedas said. Ramirez found his role model in Dolores Delgado-Campbell a professor at ARC. "I started meeting him in my Mexican-American history class. And I befriended him because he was a really nice young man. And he looked eager," said Delgado-Campbell. Ramirez not only took a liking to his new mentor, but the subject matter she introduced him to. Learning about his Mexican ancestors inspired Ramirez. He felt all Latinos could benefit from their history. So he buckled down, hit the books and learned all he could. He then went to Delgado-Campbell and asked if there were classes where he could learn to teach the history about his ancestors. Delgado-Campbell and Ruedas both recommended he go to CSU Northridge. After he graduated from ARC with honors that is where he went. Ramirez majored in Chicano and Ethnic studies. After graduating from Northridge with honors, Ramirez made his way back to Northern California to attend Sacramento State’s Multi-Cultural/Bi-Lingual Education program. The director of the program Duane Campbell (husband of Dolores Delgado-Campbell) says training minority educators and administrators such as Ramirez is essential in helping to close the achievement gap. "Having a Hispanic president of the college doesn’t necessarily lead to more Hispanic graduates," said Campbell. However, he says if minority students see other people of color achieving success academically and professionally, they will be encourage to believe they do belong in college, and they can graduate. Ramirez takes that knowledge with him each time steps foot on the campus of Luther Burbank. "We need more educators of color," Ramirez says. "If the student sees someone that looks like them and can relate to them every single day...that person is telling them look, look at me,look at you. You can do it." During school hours, Ramirez teaches a world history, economics, and Latino/Latina leadership class. After hours, his classroom transforms into special hub where he takes time to mentor students having a hard time in and outside of class. Ramirez believes the extra hours it takes to mentor students is well worth it. Occasionally, Ramirez will bring in yearbooks and graduation photos from some of his younger family members who have graduated from college. He hopes when his students see the pictures that they can envision themselves one day walking around a college campus. "They don’t know anyone there and they don’t know anyone telling them they can make it there. And I believe repetition and examples helps them to make an action plan for themselves." said Ramirez. His students have taken a liking to Ramirez’ style. Watching him interact with them, you can see how they look up to him as not only as a respected authority on their culture, but also a big brother and for some even a father-figure. At one meeting Ramirez sits down with two students to catch up on what’s going on in their lives. Elisabeth Starr catches him up on her activities at her church and softball. Before she met Ramirez she didn’t believe she would live to see her 17th birthday. Starr admits she got into fights at school and had a hard time staying focused. However, learning about her Mexican history has given her a new perspective on her education. "We had to fight to be in school. So now that we have a choice to be in school it made me really think. They fought hard back in the day for us, so I should make it mean something and be here," said Starr. For Ramirez, he believes all schools should make it a point to teach students something valuable about their own cultures. "Students need to be taught things that relate to them. We’ve been taught the same history over and over. We need to teach them a little bit about their own history," Ramirez said. "I guarantee you we’ll have less problems in the classroom." 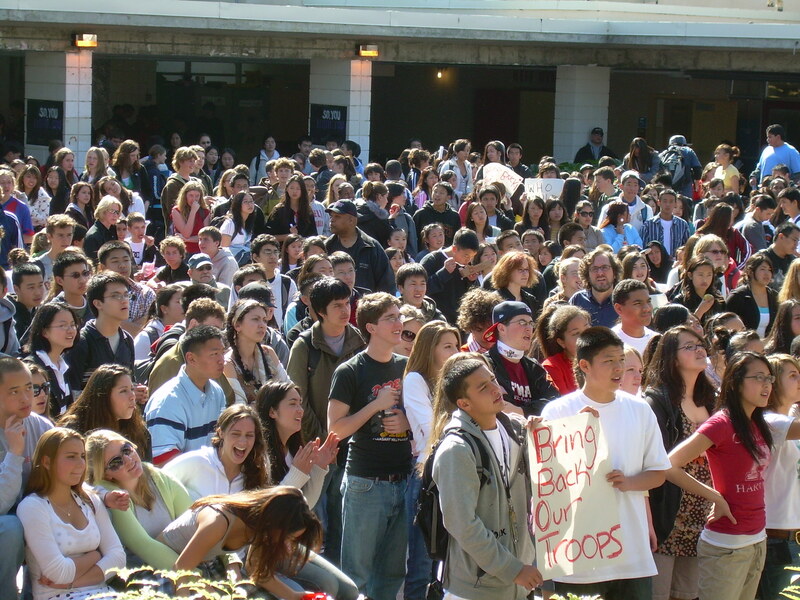 2/22 4:30 SF Youth Anti-War Rally: Tell Pelosi to Cut the Funds! More than 655,000 Iraqi deaths. More than 3,000 American deaths. Trillions of dollars spent on a war for oil -- instead of public education and human needs. We can and must end these crimes.Students from 55 schools across the Bay Area have collected thousands of signatures on a petition to House Speaker Nancy Pelosi demanding that she and Congress cut the military funding for the illegal and immoral occupation of Iraq. Join us at this important rally and speakout to tell Pelosi to respect the mandate of the people.All ages are welcome. When: Thursday, February 22, 4:30 to 5:30 P.M.
Last Thurs Hip Hop Historian Jeff Chang was in town at SF State to premiere a new film HIP-HOP: BEYOND BEATS AND RHYMES and talk about his work. The year’s most talked-about film, Hip-Hop: Beyond Beats and Rhymes takes an in-depth look at representations of manhood, sexism and homophobia in hip-hop culture. This groundbreaking documentary is a “loving critique” of certain disturbing developments in hip-hop music culture from the point of view of a fan who challenges the art form’s representations of masculinity. The film premieres on Independent Lens on PBS tonight, Tuesday, February 20, 2007. I just picked up Chang's excellent new anthology Total Chaos which presents an amazing array of voices on the art and aesthetics of the hip hop movement. He's also emceeing the upcoming Applied Reseach Center national conference Facing Race later in March in New York City from 3/22-24. 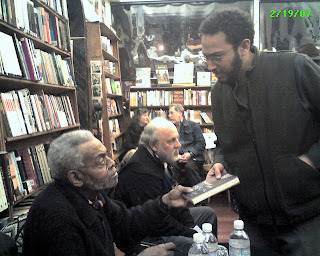 As a teacher that remembers the Last Poets, Watts Prophets, poets like Amiri Baraka [who made an appearance at City Lights last night - see photo to the right], and even Gil Scott-Heron and Africa Bambaataa, I find Chang's writing extremely helpful in bringing me up to speed with current changes in hip hop. SF Student and Youth Voices were loud and clear last thursday 2/15 with a high school and SF State student walkout to demand an end to war funding. I joined the hundreds of Lowell High School students and tried to keep up with their quick pace and youthful and defiant energy along with Lowell Teachers Ken Tray and Rick Girling. We met up with San Francisco State Students at the military recruiting center near the Stonestone Mall in SF. See Mara Kubrin's great photos on IndyBay.org and Revolution Youth's coverage as well. Welcome Home, Madame Speaker/ Congress Decides! In conflicts such as the imposition of an unfunded mandate in SB1209 (Scott), the role of legislators and their consultants is to make major decisions on issues that they know little or nothing about. They have the arrogance of power combined with a massive deficit of information. The bill SB 1209 (Scott) from 2006 imposes an unfunded mandate which will cost new teachers hundreds of dollars. One possible consequence of focusing on this new performance assessment in a test situation is to significantly reduce the dollars spent on teaching or supervision in order to pay for assessment. A second possibility is to pass along the significant cost of testing to teaching candidates. Our brief estimate is that it would cost $400 - $500 per candidate. Is this the way to recruit new people to teaching? We are currently looking for a legislator to carry a bill to repeal this mandate. A major function of bureaucracies, in this case the Commission on Teacher Credentialing and their staff is to keep the public out of decision making. Their role is to substitute their own views for information. Since the 1990’s, the CTC and the California School board have been dominated by ultra conservative, pro corporate elements. CTC staff and members make certain that the persons who do the work, teachers, faculty in teacher preparation, are not listened to. In those rare occasions when the public breaks through the bureaucratic front, both CTC and the State School Board arrange for hearings where only their own “experts” are allowed to speak. In summary, the role of these bureaucracies, and at times of legislators and consultants to is block or prevent democracy. Although the political power of the neo conservatives in politics has eclipsed as a result of the 2006 elections, the persons whom they placed in administrative and policy positions remain well entrenched. Our experience with SB 1209 and SB 2042 teach me that we need to intervene politically at an earlier stage. Early interventions require an improved policy development and monitoring apparatus and the development of legislative skills among faculty. Obama Ignites his Presidential Campaign! Young people throughout the US are inspired. In the San Francisco Bay Area websites & netroots sprout in support. While some like former Howard Dean advisor Kos challenge Obama's appeal to the netroots, support seems to be growing. In his speech, Obama did not mention his roots as the son of a man from Kenya and a woman from Kansas, his childhood in Hawaii and Indonesia or the history he would make if elected. That compelling biography has turned him into a political celebrity. Instead, he focused on his life in Illinois over the past two decades, beginning with a job as a community organizer with a $13,000-a-year salary that strengthened his Christian faith. He said the struggles he saw people face inspired him to get a law degree and run for the Legislature, where he served eight years. 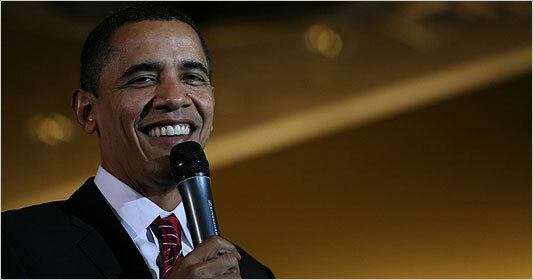 In San Francisco on 2/19 - The elites are gathering - Senator Barbara Boxer is hosting Obama. We're happy to inform you that on Monday, February 19th--in honor of her 30 years of service--California's own Senator Barbara Boxer is having an event with special guest Senator Barack Obama. The cost for the event is $150. This event WILL sell out so we strongly recommend that you buy your ticket TODAY. At the grassroots/netroots level - Local SF Obama for President folks like David Trotman have set up a great website OBAMASF.ORG that can help folks plug into the campaign. make a new friend on his MySpace site too. With fresh wounds from its ouster of Executive Director Jim Crawford last year, the National Association for Bilingual Education [NABE] Board further discredited itself with the mind-boggling decision to honor an anti-bilingual education columnist as their 'keynote' speaker for NABE's 36th Annual Conference in San Jose, CA beginning today. Because of this I had mixed feelings when I was asked to speak on a panel for the conference on Friday with longtime UC Berkeley Ethnic Studies and educational justice scholar Ling-Chi Wang on multilingualism in San Francisco schools for the conference. I decided to attend but to do what I can to be supportive of those at the gathering who will hold the NABE leadership accountable and continue our work, whether in NABE, or our statewide or regional groups to support English Learners and educational justice for all students and communities. I first met Crawford some 10 years ago when he came to visit my organization, the Northern California Coalition for Immigrant Rights, and other grassroots immigrants rights groups in the San Francisco Bay Area in 1998 to learn about our advocacy and organizing approaches in the heat of our battle against millionaire Ron Unz's Prop 227 attacks on bilingual education in CA. Navarrette, a syndicated columnist, has built his career by attacking bilingual education. He started out in the 1990s as a media consultant for Ron Unz, the sponsor of anti-bilingual initiatives adopted in California, Arizona, and Massachusetts. Navarrette went on to work for various newspapers but never forgot his English-only roots. Writing in support of Unz's ballot measures, he denounced bilingual classrooms as "linguistic prisons" where children don't learn English but are trapped, against their parents' wishes, by a school bureaucracy that's "addicted to the additional funding provided for bilingual students." (Several of his major works, including "Bilingual Programs Failing" and "It's Time To Dismantle Bilingual Education," can be accessed at Unz's English for the Children web site.) He has also specialized in journalistic assaults on Hispanic leaders, civil-rights advocates, "racist" liberals, and supporters of public education. Not surprisingly, Navarrette has been a big booster of the No Child Left Behind Act. But above all, he has distinguished himself as an enemy of everything NABE stands for -- or, at least, used to stand for -- and as a hero to anti-bilingual crusaders everywhere. Very embarrassing for the existing NABE leadership. For more on the future of bilingual education see Crawford's excellent analysis from last Fall -The Decline of Bilingual Education: How To Reverse a Troubling Trend? He argues for the need to unite advocates for English learners, Bilingual Education and 2-way Immersion programs with teachers, parents and students fighting for authentic assessments and against high stakes testing. There’s no escaping the reality that, as long as high-stakes testing continues to drive American education policy, the trend toward all-English programs will continue to accelerate. See also info on Crawfords current efforts with the newly formed advocacy organization - The Institute for Language and Education Policy. The court-martial of 1st Lt. Ehren Watada ended in a mistrial Wednesday. The case's judge, Lt. Col. John Head, declared the trial over after a day of wrangling over a stipulation of facts that Watada had signed before the trial and that would have been part of the instructions to the jury. The judge decided that Watada never intended when he signed the stipulation to mean that he had a duty to go to Iraq with his unit. Again the issue was Watada's views on the Iraq war -- opinions that kept him from going with his unit to the conflict and that the judge didn't want brought up at the court-martial. Watada, a Stryker Brigade soldier, is the first commissioned officer to refuse to be deployed to Iraq. Watada's unit left this sprawling base for Iraq in June, but Watada remained behind. He said he believes the war is illegal and that his duty is to not abide by illegal orders. But Head tried to keep the court-martial from becoming a tribunal on the war and its legality and has ruled that Watada's attorney cannot present witnesses to question the war's legality. Outside the base, that has been the issue as peace activists from across the country have rallied to Watada's side. More - View the excellent and insightful Truthout.org interview with Lt. Watada. On June 22, 2006, U.S. Army 1st Lieutenant Ehren K. Watada stepped forward as the first commissioned officer to publicly refuse deployment to the Iraq War and occupation. He faces court martial and up to 4 years imprisonment (reduced from an original 6 years maximum) for refusing to deploy and for speaking out against a war that he believes is illegal. In support of his courageous action, the Lt. Ehren Watada Campaign is working to educate and broaden the dialog on constitutional rights. The campaign is also involved with mobilizing grassroots action to insure that our government upholds Lt. Watada's right to speak out and refuse to participate in illegal military action in Iraq.